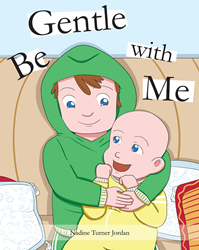 Recent release “Be Gentle with Me” from Page Publishing author Nadine Turner Jordan is a sweet and invaluable book for toddlers who suddenly find themselves the happy bigger brother or sister to a newborn in the family and are still learning how to be careful when they spend quality time with each other. Nadine Turner Jordan, a grandmother and lover of the great outdoors where she lives in suburban Minneapolis, has completed her new book “Be Gentle with Me”: a helpful children’s book for what to expect with a new baby in the family. Published by New York City-based Page Publishing, Nadine Turner Jordan’s new book is a much-needed reference for this age group, which may need the most guidance when it comes to properly managing the loveable but fragile bundle that is their newest baby sibling. Turner Jordan offers a brilliant way for parents to read aloud to their children and engage in a healthy discussion on family safety practices. Readers who wish to experience this work can purchase “Be Gentle with Me” at bookstores everywhere, or online at the Apple iTunes store, Amazon, Google Play, or Barnes and Noble.